In Agent Under Fire, you step into the role of the world's most famous agent: James Bond. In realistic first-person 3D, you will infiltrate heavily defended compounds, employing a wide variety of Q-style gadgetry and weapons to achieve your mission. In other assignments, you get behind the wheel of the most famous cars in 007's world and speed through city streets in a mad dash to prevent an evil plot from coming to life. 007: We have received a call for help from our friends across the Pond. CIA agent Zoe Nightshade has been investigating the connection between a Hong Kong based bio-technology firm, Identicon, and its parent company, Malprave Industries. Nightshade has gone missing, and her investigation is of keen interest to MI6. You must rescue her! In James Bond 007 in… Agent Under Fire™, the devious plans of a criminal mastermind once again threaten to bring the world's greatest nations to their knees and only one man can save them. That man is Bond, James Bond. Next generation console technology thrusts the player into the role of 007 like never before. Complete with high-tech weaponry, state-of-the-art gadgets, exotic sports cars, and beautiful women, this is the ultimate James Bond experience. The game's mix of intense first-person action and white-knuckle driving levels will transport the player to exotic locations where they will come face-to-face with the world's most dangerous villains. Only the clever use of firepower and tricks of the spycraft trade will allow them to save the world. Are you up to the task? Of course you are. You're Bond… James Bond. "The world needs a hero and there is only one man for the job." Immersive experience built exclusively for the next generation console system. Storyline builds on the Bond legacy with villains and allies, both new and familiar. Fast action and spy-packed gameplay inspired by the 007 films. Fantastic detailed 3D environments seen through the eyes of Bond. Up to 4 person multiplayer support. When the world needs a hero, James Bond answers the call. Intense First-Person Action with Hi-Tech Weapons and state of-the-art Gadgets. An All-New adventure with 12 Pulse-Pounding Missions. Get behind the wheel of exotic supercars -- BMW(tm) Z8, BMW(tm) 750iL, Aston Martin(tm) DB5, and more! Encounter Stunning Bond Girls, both helpful and deadly. Frag your friends in Four-Player Split-Screen action. REDWOOD CITY, Calif., Dec. 13, 2001: The world of James Bond will soon flourish on the next generation console systems. 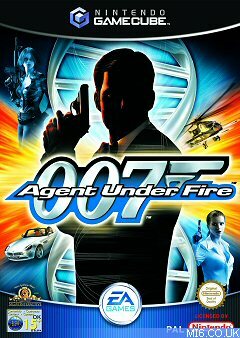 Following the highly anticipated PlayStation® 2 release this fall, Electronic Arts (Nasdaq:ERTS) and MGM Interactive will bring James Bond 007 in...Agent Under FireTM to the Nintendo GameCubeTM and the Microsoft® XboxTM video game systems in North America in spring 2002. 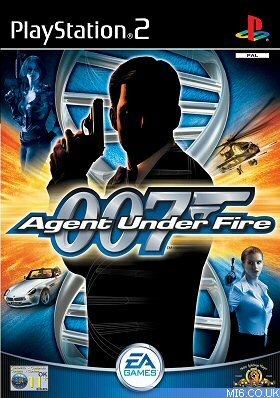 "We are very excited to follow up the highly successful PlayStation 2 version of Agent Under Fire with games for the new consoles," said Jon Horsley, Executive Producer. "With its high powered blend of first-person action and fast-paced driving, we feel the game is perfectly suited for Bond fans who own the GameCube and Xbox." As with the PlayStation 2 version, players of the two new game systems will experience a unique and complete Bond adventure that immerses the player in the exciting world of secret agent 007. The game will feature 12 mission-based levels - comprised of first-person action, covert stealth and fast driving - spread out over 10 exotic locations around the globe. The action levels will give players the option of blasting their way through each level using high tech weaponry, quietly relying on spy-craft tricks and state-of-the-art gadgets as well as nerve tingling stealth to accomplish mission objectives or a combination of all three. The driving levels, developed by the team behind EA's award-winning Need For Speed series, will feature an array of 007 exotic cars and other vehicles inspired by the Bond movies, including the BMW Z8TM, Aston Martin DB5TM, as well as a MGF-34 combat tank. True to the Bond universe, the vehicles are filled with Q-lab weapons and gadgets including rockets, guided missiles, machine guns, oil slicks, smoke screens and more. "Beginning with the PlayStation 2 and now the GameCube and Xbox, the EA and MGM partnership is committed to bringing Agent Under Fire to the latest console technology," said Neil Haldar, Executive Producer at MGM Interactive. "We look forward to sharing the James Bond experience with owners of the new Nintendo and Microsoft systems." The games will offer a robust multiplayer feature set in 12 exclusive arenas and five unique gameplay modes, including artificial intelligence bots, that will support up to four players. Agent Under Fire for the Nintendo GameCube and Xbox consoles is being produced by Electronic Arts in Redwood City, CA and Electronic Arts Canada in Vancouver, British Columbia. 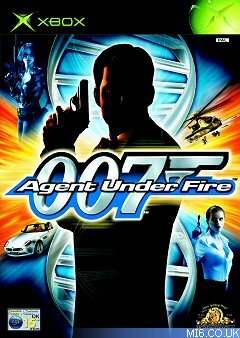 REDWOOD CITY, Calif., March 19, 2002– The world of James Bond is brought alive on the next generation console systems with the release of James Bond 007 in…Agent Under Fire™ for the Nintendo GameCube™ and the Xbox ™ video game system from Microsoft in North America. In partnership with MGM Interactive for the highly coveted 007-license, Electronic Arts (Nasdaq: ERTS) is publishing the games under the EA GAMES™ brand. The games follow the top selling* PlayStation® 2 version released last fall. The Xbox version will be available on March 26. Similar to the PlayStation 2 version, gamers of the Xbox and Nintendo GameCube systems will engage in a first-ever 007 experience on the respective platforms. The game delivers a unique and complete Bond adventure that immerses the player in the exciting world of secret agent 007 through 12 mission-based levels -- comprised of first-person action, covert stealth and fast driving -- spread out over 10 exotic worldwide locations. The action levels will give players the option of blasting their way through each area using high tech weaponry, quietly relying on spy-craft tricks and state-of-the-art gadgets as well as nerve tingling stealth to accomplish mission objectives or a combination of all three. The driving levels, developed by the team behind EA’s award-winning Need For Speed™ series, will feature an array of 007 exotic cars and other vehicles inspired by the Bond movies, including the BMW Z8™, Aston Martin DB5™, as well as a MGF-34 combat tank. True to the Bond universe, the vehicles are filled with Q-lab weapons and gadgets including rockets, guided missiles, machine guns, oil slicks, smoke screens and more. Helping to enrich the game experience, both versions feature new enhancements including a more robust multiplayer mode – specifically, the addition of Artificial Intelligence (AI) bots – that is set in 12 unique arenas and five varying modes. In addition, players can select between three difficulty modes – Operative, 007 and 007 Agent – in between each level if they chose to do so. Agent Under Fire for the Nintendo GameCube and Xbox consoles was produced by Electronic Arts in Redwood City, CA and Electronic Arts Canada in Vancouver, British Columbia. More information can be found on the official EA product web site www.007.ea.com. Both versions carry an ESRB rating of “T” (Teen) and MSRP of US$49.99. Above: Cover art for the European Microsoft Xbox and Nintendo GameCube releases. The game engine was originally developed for a version of "The World Is Not Enough" on the PlayStation 2, but due to significant delays after the release on PSX and N64, the game changed to an all new adventure. The female South American terrorist Carla the Jackal is a reference to South American terrorist Carlos the Jackal. Early advertisements for this game showed the "R" character resembling John Cleese (who had recently appeared as Q's assistant in "The World Is Not Enough"). The final version of the game substitutes a generic-looking character. An EA executive once commented that late licencing issues with Eon Productions lead to Cleese's departure from the game, but the advertising campaign had already been rolled out. Agent Under Fire has become a famous Xbox game, but not because of the gameplay itself. On March 31, 2003, a hacker called Habibi-Xbox used a buffer overflow in the game and became the first to hack into an unmodified X-box. This was part of a $100,000 challenge funded by Lindows founder Michael Robertson. M: "007, did you confront the Jackal? What happened?" James Bond: "She's fallen for me." R: "We'll leave that on Z's capable hands." James Bond: "Hmm... very capable indeed!" Images courtesy Amazon Associates and EA Games.